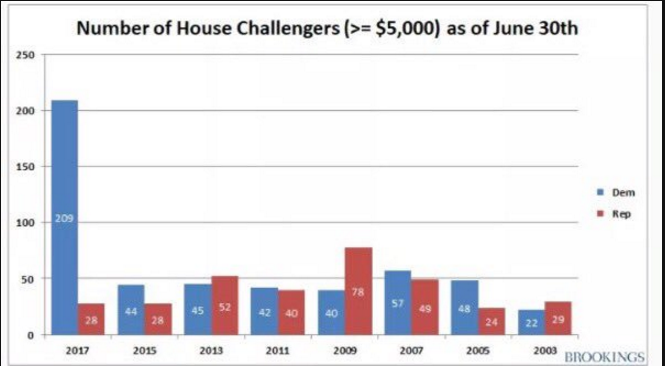 As of the end of June, 209 Democratic challengers had registered with the FEC and raised at least $5,000. That more than doubled the previous high mark since 2003. In 2009, the Republicans had 78 challengers with at least $5,000. The early GOP challengers in 2009 foreshadowed the party’s regaining majority control. The question is whether the same will hold true for the Democrats in 2018. They have already recruited more candidates than every midterm since 2009 combined. We're 18 months out. Obviously, the Democrats could still lose. But maybe it's not such a good idea to keep harping on the fact that Democrats are such worthless pieces of garbage that there's probably no point in even listening to what they have to say. All these people stepping up to do this thing and it might be useful to be a little bit more encouraging.